"Hey Tim, I don't know what you've done to my bass, but it's playing like a dream!!!!!! Thank you very much - I REALLY appreciate your effort, extraordinary skills and care." Andy Baker, professional bassist. 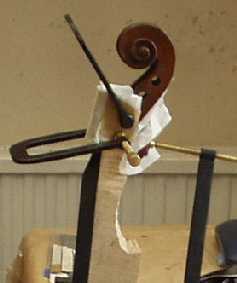 "Tim,I have now played a lot on the new cello. I like it still - a lot. The thing I think I appreciate the most is the clarity of tone and its immediate and accurate response. I think that whenever the tone I produce is unclear - it is always my fault. Not the instrument. For this reason, I find it more easy and fun to develop as a cellist and produce better music. I have increased my playing time considerably since getting this instrument. I think a good part of the reason for this is the instrument itself that inspires me to work. 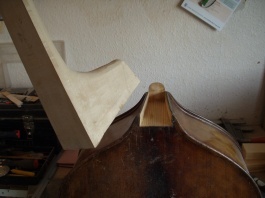 needed a new neck to be grafted into its existing scroll and body, then fitting with a new fingerboard and bridge. 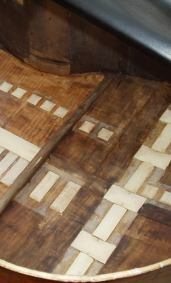 These are the processes that the restorer takes the instyrument through to give it a modern neck that is virtually indistinguishable as a mdification. 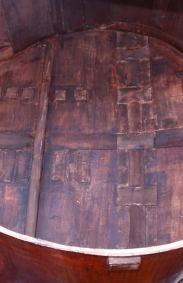 The sound-post area is badly damaged, and many years ago has been repaired using a strip of canvas. Tim has carefully removed this, then pressed out the damaged area and replaced some of the old wood with a perfectly formed egg-shaped patch that restores the original thickness. The bar is removed and replaced with a new one. 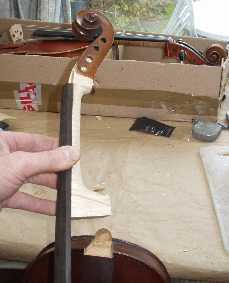 Note that two cleats are temporarily fitted to aid in keeping the bar upright during the difficult fitting stage, and are removed once the bar is glued in. Here Tim has fitted a modern bar which is longer and heavier than the original. 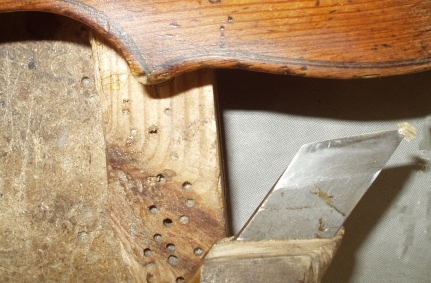 On the right, a very small piece of new pine (on the end of the knife) has been prepared for insertion into the corner where a piece has been lost in the past. Look at the finished corner on the left. Also a new edge has been fitted. 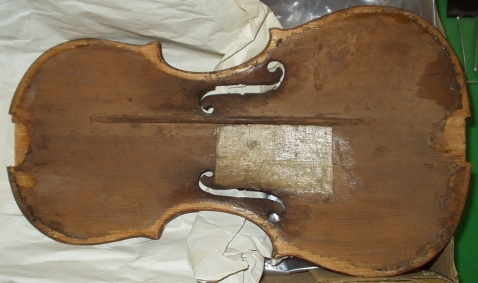 It is then finished and retouched so as to match the original and is virtually invisible on the finished instrument, shown on the right. Broken the neck on your bass? Here's how Tim would repair it for you. 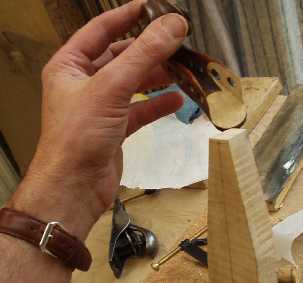 First step is to cut out the old neck and prepare a mortice in the old scroll which will then receive the new neck, carved from mature english sycamore, cut locally in Leicestershire many years ago. 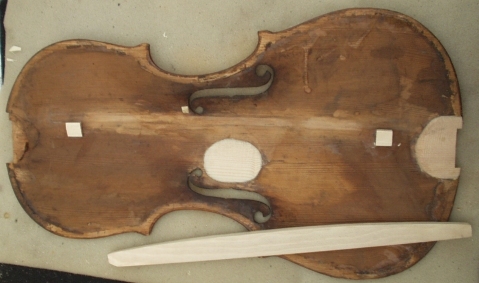 The new wood is then glued in and roughly carved to shape. Neck angle and final bridge height are determined now. 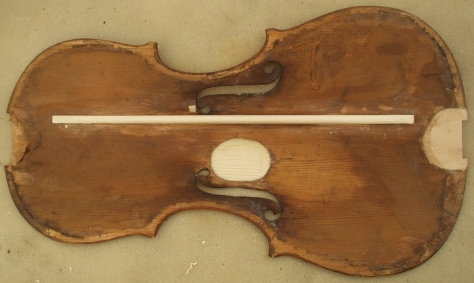 Once the bass is back in one piece, the delicate task of finishing is accomplished, using oiling, staining and varnishing techniques taught to Tim by William Luff and others many years ago. Tim always gets exactly the shape and feel that the player dictates, and the final polish gives a superbly smooth surface that your thumb simply glides over, at the same time bringing out the figure of the wood. 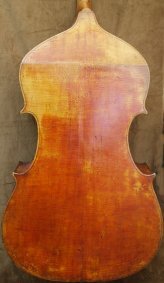 This fine old English Double Bass by John Lott Junior required extensive restoration in order to recover its fine old English tone and projection, which after all is what a bass really needs to earn its living !! Of course the cosmetic side is important, but our customers tend to take that side of Tim's skill for granted !! Many Leicestershire players and teachers will remember Tim from when he worked for David Snelling Violins, both in South Wigston in the 1970s and then in Kibworth in the 1980s.